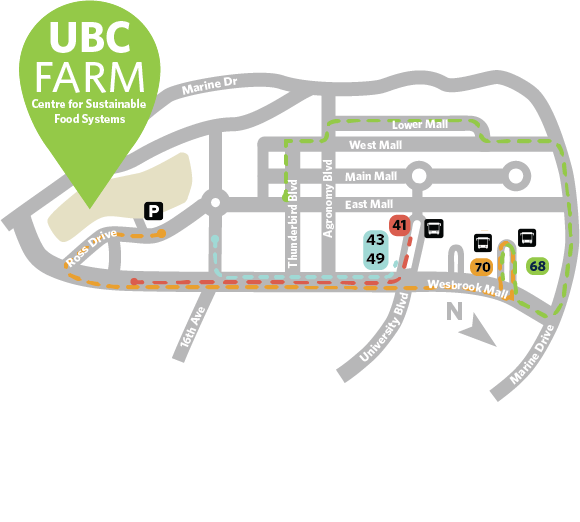 The public is welcome to visit the UBC Farm. We ask all visitors to respect and enjoy the space, and to not disturb any plants, equipment, or research apparatus on site. Please watch your footing and stay on the roads or grass pathways. All dogs must be leashed while at the Farm. The CSFS at UBC Farm general phone number is (604) 822-5092. For email addresses see our Key Contacts. 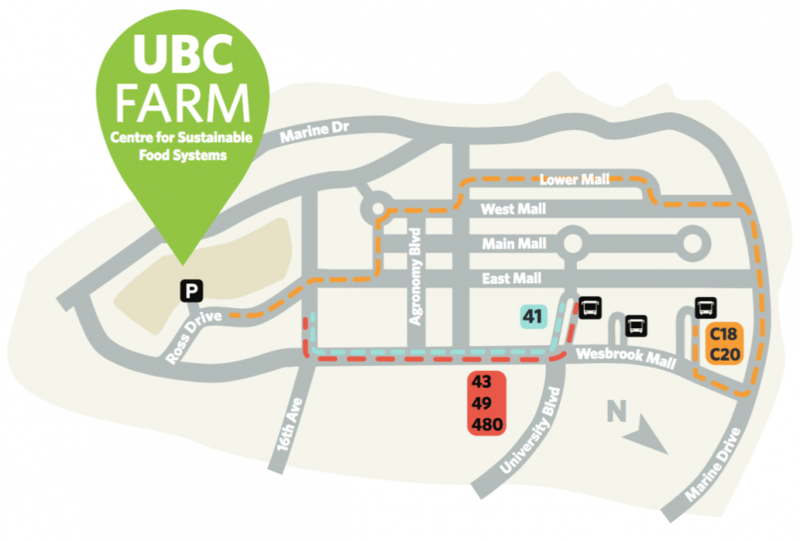 The UBC Farm site is open to the public, 9 a.m. to 5 p.m. Note: Our hours change throughout the year, based on the growing season. Note: Mail is not delivered directly to the Farm. Our mailbox is located in the H.R. MacMillan building. 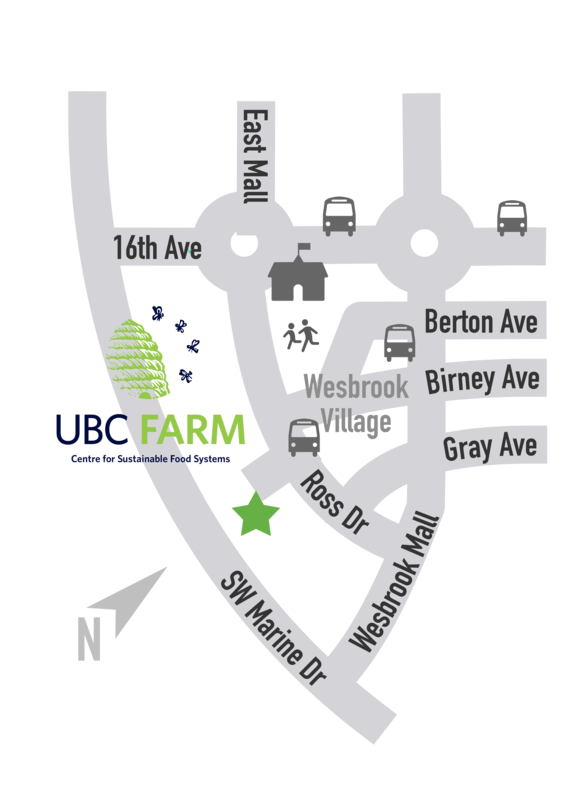 The UBC Farm is located in the Wesbrook Village area on the University of British Columbia’s South Campus. Parking The UBC Farm has a parking lot which has a limited number of spaces. The first two hours are free with registration. On Saturdays there is free parking available in the gravel construction lot at the northeast corner of Ross Drive and Birney Ave. If possible, please choose to bike, bus, or carpool to the UBC Farm. Travel south on East Mall, cross 16th Ave (it turns into Ross Drive) and take the first right into the entrance. Travel south on Wesbrook Mall and continue south through the roundabout at Wesbrook Mall & 16th Ave. 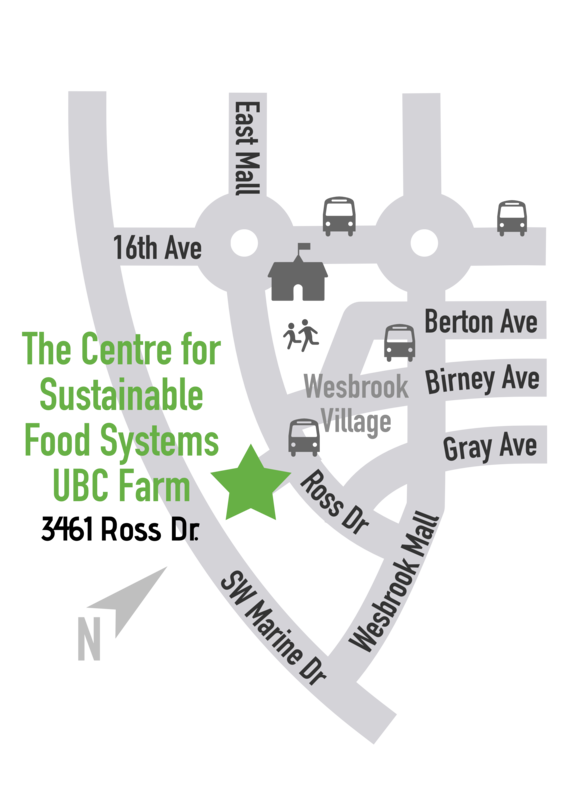 Turn right on Grey Ave (there is a large UBC Farm sign at that intersection), right on Ross Drive, and the entrance will be on your left. Q: Are there wheelchair-accessible washrooms nearby? A: None of our permanent buildings have wheelchair-accessible washrooms; however, we have a single wheelchair-accessible portable washroom just inside the farm gates/entrance. Q: Is the ground fairly open and even (any protruding rocks/roots, any potholes, any narrow walkways)? A: The parking lot in front of the gate is mostly packed gravel and dirt, though some of it is grass. It has a very slight downward slope at parts. The roads to the Saturday Farm market and Farm Centre are packed gravel with no major protrusions, but depending on the time of year and how recently it has been repaired, there may be some potholes. You should be able to navigate around them with care. If you are coming for a farm tour, the terrain is generally bumpy off the road. We have had wheelchairs on tours before, but we generally recommend having someone to push your wheelchair, if possible, and only if you don’t mind a bumpy ride at times. If it has been raining steadily, you may want to be cautious as some fields and paths are very muddy. 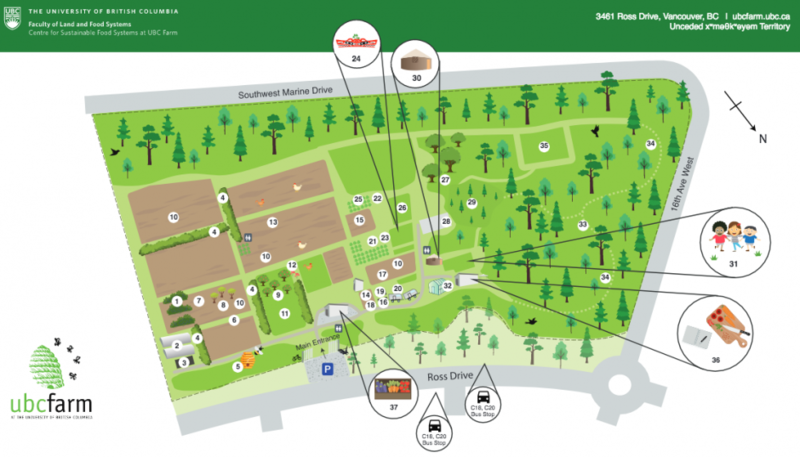 UBC Farm Map | Click to enlarge with optional download. UBC Campus map | Click to enlarge. Wesbrook Village map | Click to enlarge.